Editor's Note: With this article, we're pleased to welcome Joshua Zyber as a regular columnist here at High-Def Digest. A long-time movie buff and collector of discs from laserdisc to DVD, Josh is a staff reviewer at DVD Talk, and an enthusiastic supporter of all things High Definition. In this new twice-monthly column, Josh will be discussing a broad range of topics of interest to other early adopters. One year into the great High Definition format war, it's easy to get caught up in the partisan bickering, obsessing over sales statistics and the increasingly antagonistic press releases from each side. To do so, however, one loses sight of the true point and purpose of the Blu-ray and HD DVD formats, which is to provide a quality High Definition product for the end user to enjoy. Of course, this site and others provide thorough reviews of the video, audio, and content of the latest releases from each format, but sometimes lost are the incidental details that make up the complete experience of owning a High-Def format, from retail store shelves to the finish of disc playback at home. With that in mind, I humbly offer the following list of generally inexpensive (and completely format-neutral) suggestions to the studios that produce High-Def content. To any studio execs who may be reading this: I can't guarantee that following my advice will help your format win the war, but doing so will certainly improve your products, and should make High-Def discs more appealing to your target customers. Stop ruining movie cover art with ugly banners and borders. Yes, we understand that these are new formats and you want to visually distinguish them from DVDs on store shelves, but isn't that what the new case sizes and colors are for? Aren't the "HD DVD" and "Blu-ray" logos at the top of the case enough of a clue for people to figure it out? Do we really need ugly borders intruding into the cover art? High-Def disc buyers are by nature movie fans and collectors. The physical attractiveness of the product on our movie shelves is important to us -- marring that with hideous swooshes and slogans that obscure the poster art is really unappealing. No more promos for your format before the disc menus. There is nothing more irritating than firing up a disc in anticipation of watching a movie, only to suffer through a commercial first. We paid for this product, so please don't insult us with advertising, especially when it's an ad for the format we're currently using. Here's a tip: If we're watching a High Definition disc, we don't need a promo telling us how great High Definition is. We already know. You're preaching to the converted, and we just want to get to the movie we paid for. All discs should have a setup menu before the movie. I realize this may sound like a contradiction to my last point about getting straight to the movie, but the fact of the matter is that High-Def discs usually have a number of audio, subtitle, and other setup choices to dig through before you can finally sit down to watch the movie. I appreciate the sentiment of studios like Warner and Disney who start their movies up automatically without a lot of obnoxious animated menus, but it's a real nuisance to have to stop the movie after it's started in order to adjust settings, and then restart the movie. This is especially problematic on Blu-ray discs, where pop-up menus usually don't work if the movie is paused. On a typical Disney disc, you have no choice but to navigate through all the menus while the beginning of the movie plays beneath, and then skip back to the start when you're done. That's an absolutely terrible user experience. We don't need (or necessarily want) anything fancy -- just a simple menu page where we can check off our settings and start the movie when we're actually ready for it. Enough already with the menu clicks and beeps. On the subject of menus, all those grating beeps, clicks, and cheesy sound effects when you highlight or enter a selection have got to stop. They're nothing but an irritant. Yes, some discs offer the ability to turn them off, but only after you've navigated through a bunch of beeping or clicking menu options to find them. How about if all discs default to menu noises off, and users can turn them on manually if they want them, rather than the other way around? Or even better, just get rid of them altogether. One last menu request: Simpler is better. This is a problem that has plagued many standard DVD releases, but it's now unfortunately intruding into the next-gen formats as well. Just because the technology can render fancy 3D animated menus with elaborate graphics dancing all over the screen whenever you make a selection, doesn't mean it should. Nor should a user have to dig through page after page of menus just to find a simple option. The most effective menus are those that are simple, well-organized, and easy to navigate. That applies to the interactive pop-up menus every bit as much as it does the traditional menu pages. I don't know what the studios are doing differently in their disc authoring, but the menus on several recent Blu-ray releases like 'Dirty Dancing' and 'The Messengers' slowed my Blu-ray player down to a crawl, and highlighting a selection doesn't seem to guarantee that the correct action will be taken. The 'Dirty Dancing' menus are especially infuriating. Next time, please remember that complicated does not automatically equal better. Make adjustable subtitle positioning a standard feature. I understand that at this point in time nobody is giving a whole lot of thought to the concerns of home projection owners, many of whom are now investing in dedicated 2.35:1 Constant Image Height screens, but it's time to start -- this is a growing segment of your user base. A 2.35:1 CIH screen allows the viewer to watch "scope" movies filling the entire wide screen without letterbox bars, and it works great, except on discs where you need subtitles, which are usually authored to appear in those letterbox bars. Thanks a lot. 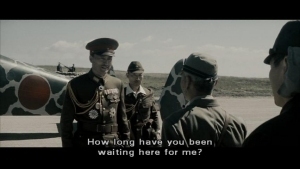 Now the movie is unwatchable, unless you switch to a 16:9 pillarbox mode which leaves you with a much smaller picture surrounded by black bars on all sides. That's hardly an acceptable solution, but fortunately both formats are capable of better. A number of HD DVDs from Studio Canal in Europe allow viewers to manually adjust the size and position of all subtitles so that those who want the subs entirely inside the movie picture can have them there, while those who want them entirely in the black letterbox bar can put them there instead. Meanwhile, Sony recently announced plans here in the US to include a similar function on their upcoming Blu-ray release of 'Immortal Beloved'. It's great to see this functionality beginning to be used. Projection users would be very happy if every studio could implement this for all 2.35:1 aspect ratio releases as soon as possible. Always provide the movie's original sound mix. We live in an age when modern movies have razzle dazzle 5.1 soundtracks or better. That's certainly terrific, but the obsession with "updating" older movies with simpler mono or stereo mixes to 5.1 standards is troubling to film purists, especially when it involves gimmicky artificial pans or the replacement of original sound effects with newly recorded substitutes. I'm sorry, but the butchery that happened to 'The Terminator' was a travesty. If you want to do something like that as an option for people who want it, that's perfectly fine -- just include the original mix, as well. If disc space is an issue, drop one of the dub tracks that are already eating up room anyway. Include all of the bonus features found on the standard DVD. Most High-Def consumers buy movie discs with the intention of replacing their old DVDs. They don't want to keep two copies of the same movie sitting around. If the DVD had featurettes, deleted scenes, or a commentary, it's an insult to drop them from the High-Def version. The new formats are supposed to offer everything DVD did and more, not just a few of the things DVD had, selectively chosen when they're convenient. Don't advertise titles you have no current plans to release. Every time I put in a Paramount disc and am greeted by their annoying promo with clips from 'The Truman Show', 'Team America', and 'Lemony Snicket', I wonder when those discs are coming out. Likewise, the promo at the start of Sony discs has multiple clips from 'Spider-Man', 'Lawrence of Arabia', and 'Bad Boys II'. How many Warner discs have come packaged with printed inserts promising 'The Shawshank Redemption'? Yet I look on the studio release calendars and not a single one of these titles is currently scheduled. Don't tease us with something you have no immediate plans to deliver. It's misleading and upsetting, and doesn't exactly engender customer loyalty. Combo discs do not justify premium prices. This is one specifically for the HD DVD studios, if only for the fact that Blu-ray doesn't have Combo discs. If a High Definition fan is buying an HD DVD, they're buying it for the HD DVD. The standard DVD version on the flip side is not a "bonus" worthy of a premium price, and rationalizations about making the disc more portable aren't fooling anyone. Combos a marketing ploy designed to lure average DVD customers to the new format with promises of backwards compatibility. And that would be fine, if only the strategy were working. As is, the high prices for Combos are scaring away standard DVD buyers who would rather stick with the less expensive DVD-only releases, and are only upsetting HD DVD buyers who are forced to pay extra for a "feature" they rarely want or need. 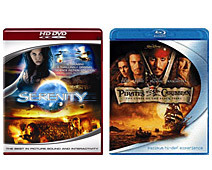 Combos should, at the very least, be priced in accordance with other HD DVDs. The same general principle applies to most of Fox's Blu-ray releases, which (up until they stopped releasing new discs altogether in April) have usually come deprived of special features, yet are priced higher than discs from fellow Blu-ray studios. Who exactly is that supposed to appeal to? I feel better getting that off my chest, and I genuinely believe that these suggestions can help improve both formats. Now it's your turn: what would you ask the studios to change about their High-Def disc releases? We've set up a dedicated thread in our forums area for discussion of this topic. Let's hear what matters to you!